We stock bronze bushings in multiple sizes from 1/4" x 1/8" (M x F) to 4" x 3" (M x F). Our bronze bushings are of high quality and corrosion resistant to perform in many applications. Allow Shaw Stainless to quickly facilitate your bronze bushing, pipe and other fitting needs. Our threaded, bronze bushings are available in multiple sizes for various piping applications. View our product line card. View our bronze bushing and other product dimensions. Please review our product dimensions. Our pipe sizes and weights chart can help in your search for general nominal pipe size information. Bronze bushings conform to ASTM B62-93 (85, 5, 5, 5) C83600. Dimensions ANSI B 16.15, Threads are ANSI B2.1 or BA21 and Fed. WW-P-460 UL/FM approved. View our standard specifications chart. View thousands of bronze and stainless steel pipe and tubing products and various custom fabrication services Shaw Stainless offers. Use our Reference Catalog to help identify your needed bronze fittings with our specification charts and product illustrations. 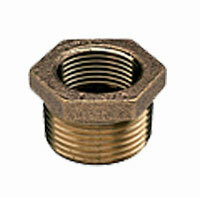 Bronze bushings are pipe fittings with male threads on the outside and female threads on the inside.